How hard is it to produce something that will get your store on the evening news, on Vimeo and YouTube, and end up being posted on your customer’s Facebook walls? Let me tell you about the “flash mob” event we just did at Orange Tree Imports, which cost us less than $500 — but in terms of public relations and social media buzz was priceless. It all started with an original song that was created for our store as the result of our bid in an online auction for Wisconsin Partners for Sustainability, a local environmental organization (WPS was the original sponsor of Dane Buy Local, our area’s shop locally movement). The donor of the creation of a song, Andrew Rohn, wrote Walmartopia, an witty anti-big box musical that was produced off Broadway. Together with his writing partner Matthew Sanborn, Andrew created a wonderful seasonal song for our store that even features some of our kitchenware products as rhythm instruments. 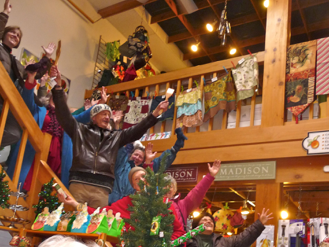 We asked for volunteers from the community to sing the song in the store as a surprise for our staff and for any customers who happened to be on hand, creating a seemingly spontaneous event called a flash mob. Although it was a surprise, we did tip off Channel 3000 — a local TV station that has been very supportive of the Buy Local movement — and they agreed to send a film crew. Flash mobs are often captured by bystanders using iPhones and flip cameras, but we wanted to have this event posted on YouTube before Christmas — and to capture the fun lyrics and great harmony and rhythm of the song — so we hired a videographer to tape the performance of the song and to edit it. Our total cost was under $500, counting the recording and editing, gift cards for the two composers, and a “swag bag” for participants, as well as coffee, tea, muffins and mimosas at our house beforehand to get the singers feeling festive. The television station not only carried the news story the evening of the event, but also posted an article about it on their web site and put the TV clip on YouTube. We posted our flash mob video on Vimeo initially, and then also on YouTube. Once the video was online we sent out an e-mail message to our customer e-mail list with a hyperlink to Vimeo. So far it’s had over 700 hundred views in two days — I hope you’ll take a look too. I’m happy to report that the day after the news story we had lots of customers in the store talking about it. 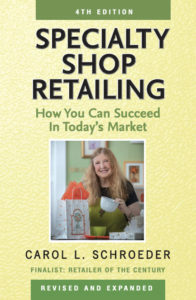 That’s the kind of buzz that can really help build your brand, and make your store a success.